Bodybuilding.com Supplement Company Of The Month: ALLMAX! ALLMAX did it right from the get-go. You know what's in its products and you can trust the company. What else could you ask from the July Supplement Company of the Month! ALLMAX Nutrition was one of the myriad companies launched in the mid 2000s, a time when new supplement companies seemed to pop up every week. Thanks to a loyal customer base and smart business sense, ALLMAX popped and moved up quickly in the industry rankings. The IsoFlex Protein and BCAA formula, Aminocore, are two of ALLMAX's more popular products and it has big plans moving forward in 2012 and beyond. It should come as no surprise by their positive reviews and overwhelming popularity at the expos that they are now being recognized as the newest Bodybuilding.com Supplement Company of the Month. ALLMAX Regional Sales Manager Mike Esparza is going to educate us on all things ALLMAX from the beginning, to what we will see in the future. Q: Tell us about your competitive background? I began training at the age of 15, but had been interested in doing so at a younger age. I remember idolizing my uncles' huge biceps and ability to bounce out push-ups when I was as young as 8. When I began training, my dad always told glory stories of his youth and his tremendous leg and shoulder strength. Who doesn't want to emulate dad! So it began from there. One of my earliest gym memories is of an older gentleman explaining the art of the squat to me. His words shaped my approach to training ... "son, the body is an amazing structure, and as with any structure is must begin from the ground first! Build a strong base with your legs, and the rest will follow!" I first found myself getting faster for sports. I became a better overall football player, my speed increased for baseball and I began to blow away many of my counterparts on the hockey rink. After training for two years I was ready to allow my dad to come to the gym to watch me squat. He had been bugging me for awhile after seeing me add muscle and boast of my strength gains (come on, who doesn't brag to impress their parents!). At this point I was 17, a religious member of "Mack's Gym" in Toronto, and eager to learn the sport of bodybuilding. I squatted well that day, 4 plates, 405 pounds for 3 sets of 8. I weighed 175 pounds at the time. Dad was impressed, and took me that weekend to sign up with the guy known as Canada's bodybuilding coach at the time, Scott Abel. 4 years with Scott saw me go from 175-pound kid with little abs and a little muscle to a 250-pound 20-year-old with abs. He taught me to be diligent with my training and log books, and NEVER miss meals! My idol and mentor, the late Tom Hall (IFBB Pro, never defeated) was the most influential to my bodybuilding career. Tommy taught me what was wrong-from-right inside the gym and out. Tom took the time to teach me the correct biomechanical way to do every exercise, showed me how to eat like a bodybuilder and why. Tom passed away 3 weeks after my first ever show October 1, 2005. He never got to see me compete; he had some family things to attend to that weekend. My second show, 3 weeks after he passed, was to be the first time he saw me compete. It was the hardest thing I've ever done, but I did that show, and every show for the rest of my career in that great man's honor. Why was ALLMAX better for you than other brands? I've been in this game for a while now, and I've tried just about every product. There tends to be less and less difference from one company to the next as time goes on and the industry gets smaller and smaller. I was really careful about what company I lined up with. I am extremely careful with my personal brand and who I am willing to recommend is a huge part of that. ALLMAX has a line I can be absolutely comfortable recommending with a completely clear conscience. Products like ISOFLEX, a truly exceptional Whey Protein Isolate that is produced at 4 degrees Celsius throughout to maintain all of the critical protein fractions; it's easy to mix, easy to drink and great tasting. Or AMINOCORE, backed by some really solid science with more than 8g of BCAAs per serving; it mixes effortlessly and has taste for miles. I like that they have a full line of essentials - straight ingredients like creatine, glutamine, beta-alanine, CLA or arginine, but at the highest quality, triple tested and sourced from the best raw materials. Their whole line is like that - and they don't hide ingredient amounts in proprietary blends. Their line is just a solid list of strong products anyone who is looking to gain will seriously appreciate. What are your favorite ALLMAX products? 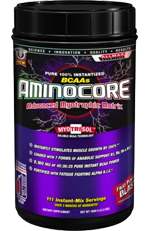 As I mentioned above, I am a huge fan of the AMINOCORE, I drink it during workouts to keep catabolic breakdown to a minimum and up-regulate anabolic activity; it's great to sip throughout the day. Let's face it: if you can limit protein degradation and increase protein synthesis, you're halfway there, right? ISOFLEX is a no brainer, amazing taste, 27g protein per scoop, super easy to mix and extremely tasty. CASEIN-FX is solid, perfect before bed. The straight ingredient essentials are very good. I particularly use a lot of the glutamine, the arginine (before sleeping) - beta-alanine pre-workout (5 g) with the RAZOR8 Pre-Workout. TESTOFX is a good test booster/aromatase blocker. What I really like about it is the cortisol blocking. Very few test products out there address cortisol as an issue in limiting test production, but TESTOFX has a blocker with research showing a significant decrease. Why should new customers check out ALLMAX? Basically, because you can trust its products. While other companies tend to go with products they think they can sell, ALLMAX has shown me that it sticks to its values. AMINOCORE is a good example, based on BCAA research out of Sweden that specifies a specific ratio of leucine/valine/isolecuine and more than 8 g of BCAAs. Even though amino acid prices have shot through the roof, ALLMAX kept its formula as is, matching the research. Same could be said of ISOFLEX, expensive, yes, but it kept it as a pure whey protein isolate while other companies have switched to cheaper forms. If you're using straight ingredients - look closely at theirs - for instance, CLA, they use branded Clarinol, and at 95% purity with the specific isomers indicated by research to be most effective; a lot of other brands go on the cheap with 80% material. ALLMAX Nutrition started in 2004 when a noticeable gap was seen between what consumers were looking for and what the supplement industry had to offer. We set out to fill that gap with research-driven, athlete-tested and approved products. We also wanted to manufacture these products with premium quality ingredients and in facilities that uphold the highest standards in the industry. We also found that too many companies were using proprietary blends and hiding the ingredient amounts from the consumers. Creating products with full label disclosure (no prop blends) was important to us and our customers. It allowed consumers to see what active ingredients were included at amounts that were backed by clinical research. I am a Regional Sales Manager for ALLMAX Nutrition. I have been a lifetime athlete, participating in high school and collegiate sports at a high level. I have been playing adult league soccer since 2004 and continue a regular training program. I have a degree in health science and am a certified athletic development trainer. My sports nutrition sales career started in 2000 with a California-based distributor. It was about then that I started working with Bodybuilding.com. In 2005, I joined the ALLMAX Team and have had the opportunity to help grow this amazing company in the United States. Our flagship product is ISOFLEX whey protein isolate. It has exceptional ingredients and phenomenal taste. Our BCAA product AMINOCORE is also doing very well. Research-driven ingredients, completely instantized and again easy on the palate. On top of that our essentials have been very strong too. Caffeine, Creatine, Glutamine and Beta-Alanine powders are all in our top 10 sellers. Are there any new and exciting products you are coming out with soon? Our new blended protein, HEXAPRO, will launch 1st quarter 2012. It is a blend of 6 proteins, essential fats, digestive enzymes and again a taste that is unmatched. Have you sponsored any athletes and if so how have they impacted your company and the industry? Ben Pakulski, Nicole Costa and Andre Rzazwewski are a couple of our top athletes. We also have a lineup that includes athletes from the MMA community, powerlifting, football and golf. We have some incredible international athletes as well as a strong grass-roots amateur athlete program. Having worked with our athletes, I've been able to see that the hard work and dedication they put into their training is the same ethic they bring to working a trade show or event for ALLMAX Nutrition. They are some of the friendliest and knowledgeable people you will ever meet. Ben Pakulski is our newest signing and this will be a breakout year for BPak and we are excited to be a part of his success. First up are the Flex Pro in February and the Arnold Classic in March. Every customer is different and unique, but if I had to choose one product it would be protein and specifically isolate protein. Protein provides amino acids that are the building blocks of any diet whether it is for a training athlete, weekend warrior, or everyday soccer mom. Within a quality isolate protein like ISOFLEX you get more than 6.5g of BCAAs, 5g of glutamine and with our cold-temperature processing you get the highest level of growth factors that help with recovery and immunity. With a good isolate protein you get 3-4 products in one. Oh and the taste is phenomenal! The best thing about the supplement industry is our ability to change people's lives. We are educators of health and nutrition. We have the opportunity to motivate and inspire people to become more active and healthy. I believe ALLMAX Nutrition and our team of athletes, salespeople, demo staff and forum advisors are an integral part of our success and the success of our industry. The worst part of the supplement industry is that not all companies and representatives of companies are on the same path of sharing and educating health and nutrition. Sometimes the quick dollar can overpower that. Find AllMax Nutrition Aminocore on our store. I would like to thank Jeremy and Ryan DeLuca for the opportunity to work with such an amazing company. We all started as young guns in this industry and are now considered the savvy veterans. I have seen these two guys develop into amazing husbands and fathers and into the top professionals our industry, or any industry for that matter. The impact Bodybuilding.com has on our industry is so incredibly vast. The ability to share health and nutrition at this grand of scale is unparalleled in any industry. I look forward to working closely with Bodybuilding.com as it continues to grow and inspire.